I remember watching the Academy Awards on TV years ago when actress Sally Field (Gidget/Flying Nun, or Forrest Gump’s mother, for those in their 20′s) gave the most hideously saccharine Oscar acceptance speech. “You like me! you really like me” she gushed. At the wise old age of 12 years old, I was horrified. I thought to myself “you silly desperate woman”. Thus it was a little disconcerting after launching this blog that my Social Media guru Suzanne swanned off to Sydney with the parting words “we must talk about getting people to like you on facebook”. Huh? As if it wasn’t enough taking a blog live, now I had to join the unashamed “please like me” culture of facebook! I had avoided facebook like the plague until this year, due my early experiences of people posting useless information I just wasn’t interested in, of the “look at my dog’s haircut” variety. I thought it would be kind of cool being the last person on earth to have a facebook page, I’d be the champion of the late adopters. However on the basis that it was just another thing slightly outside my comfort zone to play with, I’ve started playing on Facebook. Because I am new to this, I got confused – did Suzanne mean “friends” on my community page or “likes” I wondered. As my husband is too self absorbed collecting his own likes for his own community page to help me, I reluctantly went, cap in hand, to the kids for guidance. When I asked my 16 year old the difference between friends and likes she simply refused to help – ‘Oh god, people over the age of 45 just shouldn’t be on facebook”. So I went to the next one down – my 12 year old son whom I had just discovered had his own page, which he clearly must have lied about his age to set up. But he is so hard-wired digitally he can’t actually explain anything and just stared at me blankly. As the WTFproject “likes” dribble in, and my friends remain static, it has clarified to me what it is about being liked on Facebook. My motivations for doing this blog was simply about just doing it and I would sincerely love it to inspire people in some way to do their own WTF project. I know it inspired Suzanne to go to a personal trainer (can I share that Suze? Too late, serves you right for abandoning me) and another friend to do their own tumblr blog. 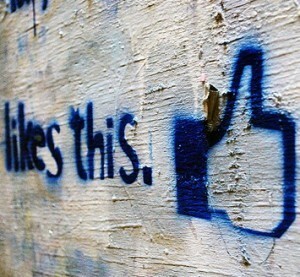 Thus the more likes I get then hopefully the more people living or at least thinking a little differently. That’s my story anyway…..feel free to like me..